Hubase-i, Inc. has released an Android game app called “Susheez Catcher 3D - come and get’em all!” on Google Play of 191 countries all over the world simultaneously. Susheez Catcher 3D has exceeded 10,000 downloads within four days since its release. This game will allow users to enjoy the well-known arcade game, claw crane on their phone. Sushi characters planned and designed by happyproject,inc., “Susheez” are available as for the prizes. 1. Visually move the “box with characters” to 5 different directions (front, right, left, up, back). 2. Change the background scene to sushi shop, Egypt, space, etc. 3. Upgrade the claw and the joystick to grab the prizes more easily. 4. Get high scores and compete with people all around world by grabbing rare characters, making combos, etc. The game will be released in English version, in Japanese version, and in Korean version. As for in Korean version, we are emerging cooperation with 3 Korean partners, named N2G, LGU, and Nolpan Design in order to localize the language and promotion in Korea. iOS version will be launched at the end of August. We’re also planning and ready to increase partnership with non-English speaking regions at any time if and when necessary. Characters designed based on famous sushi toppings, planned and produced by happyproject,inc.. 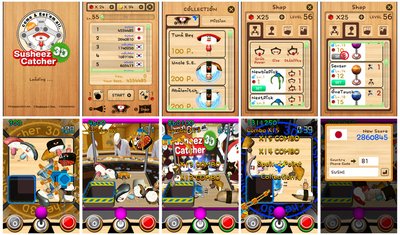 Some of the unique and cute characters are Tuna Boy, Shrimppy, Uncle S.E., Sea Urchinist, Inarian, and Wasabin Radin. A company that creates happy characters and animations for people around the world. A company that plans, produces, and distributes exciting digital contents for local and global market. ※GooglePlay and Android are a trademark or registered trademark of Google Inc.
※AppStore and iOS are a trademark or registered trademark of Apple Inc.
※In addition, all sorts of names, company names, and product names listed in this release are trademarks or registered trademarks of other companies.